Over 170 easy-to-make recipes Full-color photos throughout Side dish pairing suggestions Tips for food preparation and storage Comprehnsive Index Picture it. You are holding a cookbook featuring amazingly easy recipes with tantalizing variations on familiar themes, using ingredients you already have on hand, with vivid imagery and easy-to-follow instructions, with simple suggestions for everyday dishes and holiday specials all wrapped up in one beautiful full-color volume. 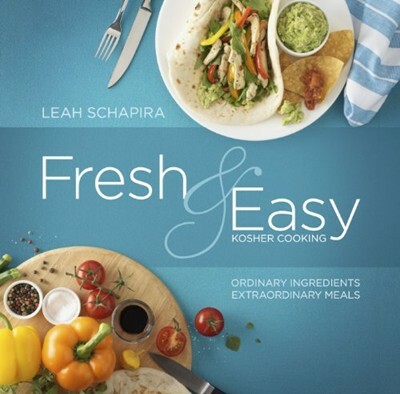 Welcome to Leah Schapira's Fresh & Easy Kosher Cooking: Ordinary Ingredients Extraordinary Meals! Leah is a rising star in the rapidly expanding genre of kosher cuisine. Her energetic passion for creatively simple cooking is boundless, as her illustrated Menu Suggestions reveal. A weekly magazine food editor and founder of a popular online recipe exchange, Leah understands what so many of today's kosher cooks most want and she's delivered it in this gorgeous cookbook. Her approach to cooking is straightforward and basic; her finished results are consistently and deliciously excellent. With so many great ideas for simple-to-make meals, Fresh & Easy will quickly become one of your most popular cookbooks!